Do you want to FEEL good? Do you need more energy? Let the health benefits of aerobic exercise reward you with abundant fitness today! Feed Your Soul... have you been to the english deer park? 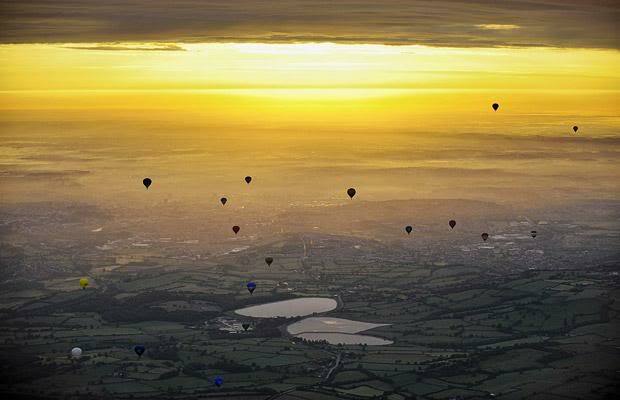 Ashton Court Deer Park is set high on the Somerset hills overlooking the city of Bristol. From its woodland slopes, you can see the lush fields below where hot-air balloons take flight each summer in a riot of color, and below these fields, the regal splendor of Ashton Court Mansion. The Balloon Fiesta was always a favorite time of year for me, and I would often enjoy the spectacle with an ice-cream in hand, watching with craned-neck, as balloons circled an azure sky (the rain knew well enough to stay away on these balmy evenings). However, while this recollection is vivid, it is not the over-riding memory that comes to mind when recalling this special place. Instead, the day I remember is cold with a swirling drizzle that clings at the dawn air; summer - with its circling balloons - is a handful of months away. A heart that beats thickly in my chest; a nose that wetly streams; hands turning blue despite the mitts on my fingers; the stinging pinks of knees beneath running shorts. Why didn't I stay in bed? This over-riding thought circles my head as I begin the lung-bursting assault on the hill that leads to the deer park's gates. In the gloom, I see the gates are open and I hurry inside. Picking up the pace to my morning run, my feet find the reassuring flat of the tarmac with a slap, slap, slap; and as I glimpse out into the fizzing rain... I see her... standing out in the center of the road; and as the young deer calmly watches my approach in the chilled air, I find a grin slowly warming my features. And as I begin my descent to the waking city - wet, but no longer tired - I feel my spirits climb. This important health benefit should NOT be overlooked, as this spiritual awakening - the basic act of 'feeling good' - puts a golden seal around everything you do. A positive mindset reinforces every health benefit you will experience. The great outdoors is nature's safety valve and you should use it. How often do you take the time to marvel at this miracle we call life? Not enough is the likely answer. Busily cocooned in our personal lives, we flit from home to job with no time to engage with the outside world. Yet we MISS OUT by not taking advantage of this inspiring spectacle: the fresh air is ours to enjoy; the ground beneath our feet is ours to tread; and the cost to you? The health benefits of aerobic exercise are far-reaching, and will touch many unexpected areas of your life. These are just SOME of the health benefits which can be yours. And the price? A handful of minutes spent reconnecting with the joy of being active! However, these health benefits of aerobic exercise are just the tip of a very large iceberg. You can enjoy these benefits today. The benefits of aerobic exercise are far-reaching and will positively touch every aspect of your life. Let the health benefits of aerobic exercise reward you with abundant fitness. Go to Hindu Squat... Where Did YOU Hindu Squat Today?